This entire week is going to be devoted to new Christmas toys - and probably most of next as well! There's a ton coming out right now. Playing Mantis has a new series out based on the great show Mickey's Christmas Carol. There's been lots of versions of the classic tale, but this is a favorite of Disney fans. 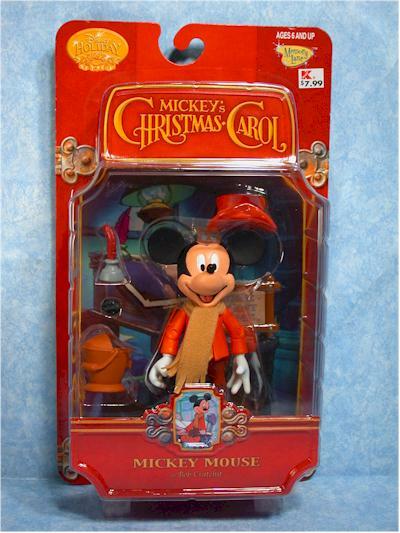 The set includes 10 figures, including Mickey Mouse as Bob Cratchit, Minnie Mouse as Mrs. Cratchit, Donald Duck as the nephew Fred, Goofy as Marley, Scrooge McDuck as Scrooge, and Morty Mouse as Tiny Tim. There's also a three pack which I haven't seen yet of Jiminy Cricket, Willie the Giant and Pete as the ghosts of Christmas Past, Present and Future. The tenth is a K-mart exclusive glow in the dark Goofy. I picked up Mickey at K-mart last week, as well as the exclusive GITD Goofy. I expect after having played around with this one that I'll pick up the whole line. They were $9 each at K-mart. I'm betting we'll see them at Wal-mart and Target for sure, and possibly Toys R Us soon. The packaging fulfills the basic requirements - it's fairly attractive, highlights the license, shows the rest of the line, is sturdy, and doesn't take up *too* much room. These packages get a big plus though - each has unique text about the character from the movie on the back! And not just a sentence or two, but several paragraphs. That's a nice touch that we certainly don't see often enough. It's Mickey, that's for sure! The head sculpt is right on, and I love the smiling, bright eyed expression. 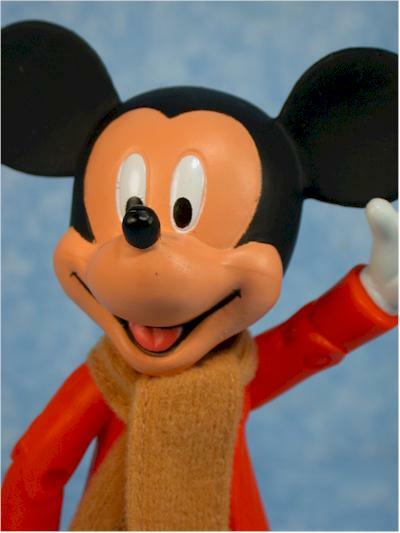 That's the way you expect Mickey to look, and he even captures the happiness in the face of adversity attitude of Cratchit. The hands are sculpted in two different positions, and while his accessories aren't really intended to be held, several still work. The scale on these figures is also a great aspect. Mickey stands at about 5", and the rest of the line is nicely scaled around him. 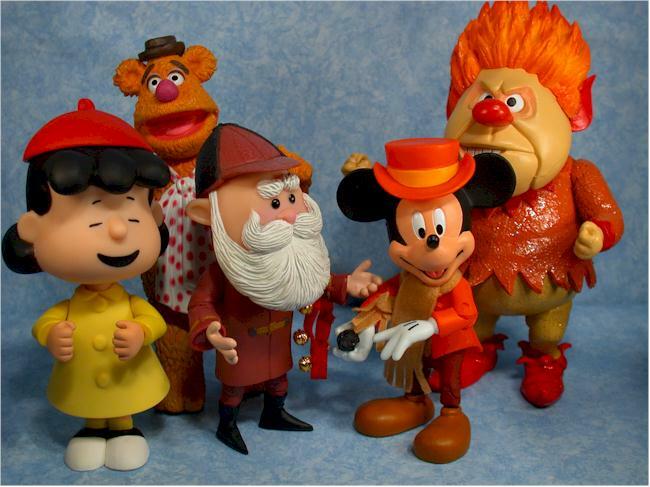 Characters look right together, and this line fits in fine with the Peanuts and Rudolph lines. I always thought the Peanuts line was too large, and I think they've done a great job getting these at just the right size to look great, but not be over powering. This is the only category where I was somewhat disappointed. The paint ops aren't terrible, but average at best. It's particularly annoying on Mickey's face, where the white of his eyes, black of his head, and tan of his face tend to have real issues. The lines between these colors are fuzzy, unclean and there's some bleed and over spray. The colors are bright and consistent however, and the detail work is decent. But you should pick your figures carefully, looking at them closely to get the best possible paint jobs. I was very surprised by the amount of articulation in Mickey, and it looks like the majority of the line has plenty of joints. 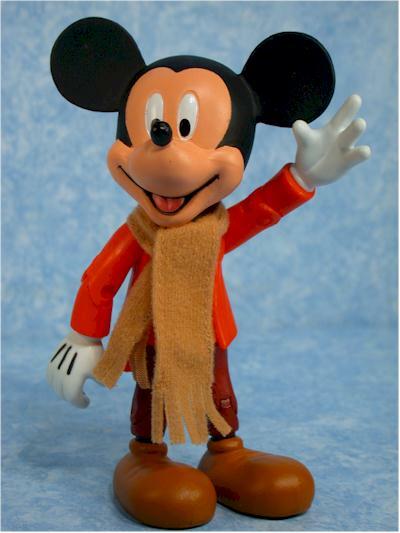 Mickey has neck, shoulders, pin elbows, wrists, pin knees, waist, hips and cut ankles. His hip joint is similar to the split ball joint we've seen in other cartoon figures from Playing Mantis and Palisades. Ball jointed shoulders might have been nice, but that's being mighty picky. 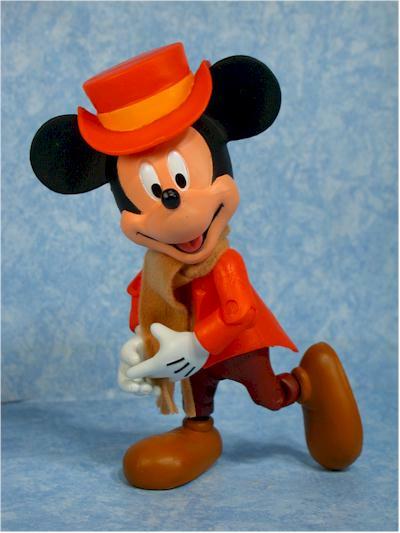 With all this articulation there's a ton of cool poses and possibilities for Mickey. 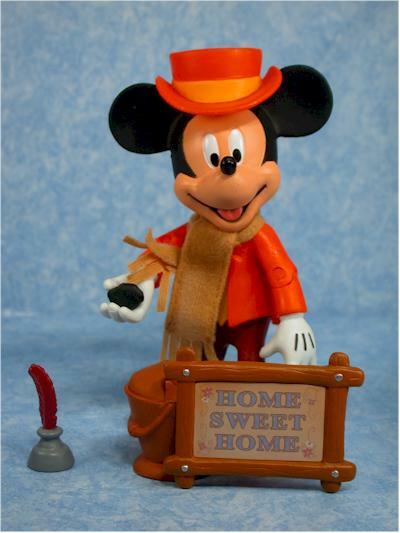 Mickey comes with his hat, scarf, coal bucket, lump of coal, pen/ink well, and 'home sweet home' sign. All the accessory sculpts look good, and the paint application was fine. The hat has a bit of a tough time staying on, as it's a very tight fit between the ears, and the coal is really the only accessory he can sensible hold in his hands, but this is a good assortment for the price, and all make perfect sense in the context of the story. Seven bucks would be a perfect price for these, but at eight they still aren't an awful value. Considering the high level of articulation, and what can't be a cheap license (hey, Disney isn't known for 'cheap'), the price isn't too far out of line. I hadn't planned on being quite this enamored with this figure. I had to really battle with my evil self in the store, trying to decide whether I should spend eight bucks a pop on any of the other figures. I finally decided I'd just grab Mickey for the review, and see how he looked outside his plastic prison. Sure enough, I'll be picking up the rest of the line over the next couple weeks. I'd love to find them for $7 each or so, and I'm going to do some shopping around, but they are some great figures and will really look excellent on the shelf for the holidays. - Entertainment Earth has the regular set of six figures in the first wave available for $50. They also have the three pack of ghosts up for pre-order for $25.